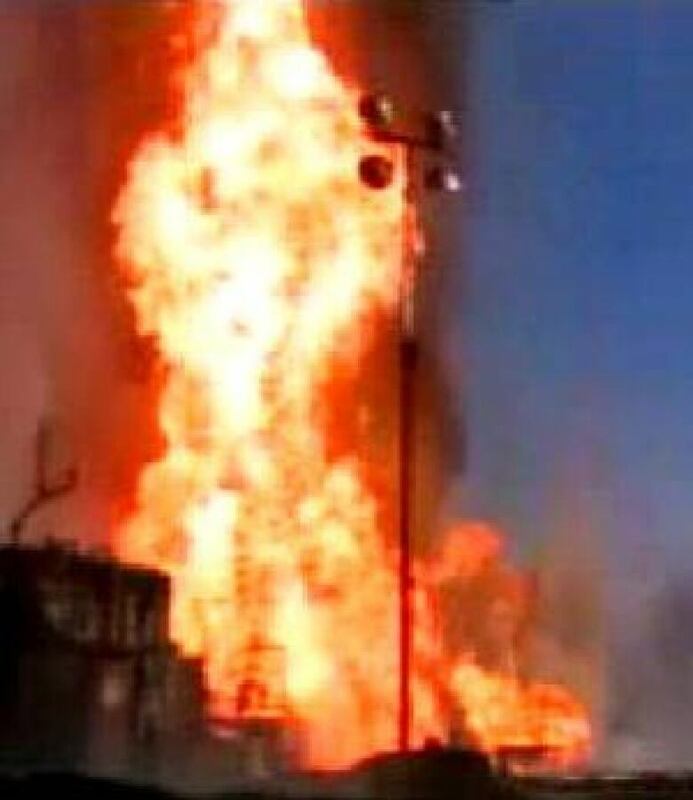 Sour gas well blows out, burns in northwest Alta. A sour gas well blew out Wednesday morning and was burning throughout the day about 19 kilometres northwest of Hythe, Alta. A sour gas well blew out Wednesday morning and was burning throughout the day northwest of Hythe, Alta. The well, which is owned by Canadian Natural Resources Ltd., caught fire around 3 a.m. local time while a crew was drilling on the site. No one was hurt. The cause of the blowout hasn't yet been determined. "You can see a plume of dark grey to black smoke coming over top of the trees, you can't smell anything at all," said Hythe Mayor Gary Burgess. "Something like this is definitely a concern. I just hope that we find out more about it soon, so we know where we're at. And if there is … no threats or reasons to be concerned, then we need to know that, too." The closest home is more than seven kilometres away, outside the well's 400-metre emergency planning zone, said Bob Curran, a spokesperson for the Energy Resources Conservation Board (ERCB). "So at this point, there is absolutely no risk to public health or safety from this well," Curran said. "In fact, we don't know if there's any sour gas flowing from this well at all," he said, adding that the fire makes assessing that difficult. The well was targeting sweet gas, he said, but had to be licensed as a sour well in case pockets of sour gas were encountered during the drilling process. "In Alberta, the requirements are that you have to prepare for the worst possible scenario." Crews were on site, trying to contain the fire. It's not known how long it will take to put it out. The RCMP have set up barricades in the area, as well, said Cpl. Carol McKinley of the Grande Prairie detachment. "Our role at the time, and currently, is to retain a perimeter near that well site to ensure public safety," she said. Inspectors from the ERCB are also on site and have started an investigation into what caused the fire. An air-monitoring unit has been set up in the area and no sour gas has been detected. Curran believes that the fire might be burning off the outflow. Sour gas contains hydrogen sulphide, a toxic and flammable substance. The blowout occurred a few kilometres from a Canadian Superior Energy sour gas testing site where people from Trickle Creek Farm have been holding a protest vigil against gas drilling. "It's rather providential that this thing blew up while we were protesting, insofar as it punctuates our concerns," said Wiebo Ludwig, the leader of the community and a convicted pipeline bomber. "They told us we'd better get out of there about 6:30 this morning," he said. "The reaction time is awful because it started apparently at 3:30 already, and we didn't hear about it until 6:30." Some members of the community used snowmobiles to get close enough to the blowout to get photographs, Ludwig said. "Everything is burning there, the whole well site, all the trailers too are getting set on fire," he said. "We have reasons to worry when we're surrounded by that kind of development here."